"The Code Talker," by Chester Nez with Judith Avila, is the first and only memoir by one of the original Navajo code talkers of WWII. The book is dedicated to the 420 World War II Navajo Marine code talkers -- men who developed and implemented an unbreakable communications system that helped ensure the American defeat of the Japanese in the South Pacific. After the war, the code talkers were instructed to keep their role in the war secret. The code was finally declassified in 1968, 23 years after the war's end. Chester Nez is now the last surviving member of the original 29 code talkers. There are any number of Web sites with information about the code talkers, but go to their official site as a start. Filmmaker David DeJonge is creating a short film about Chester Nez and the Navajo Code Talkers that will be used as an educational tool in classrooms, as well as for PBS. DeLonge also did a film called, "Pershing's Last Patriot." Watch a Preview of the Nez film. Learn more about the film, as well as how you can support the project by visiting survivorquest.org. 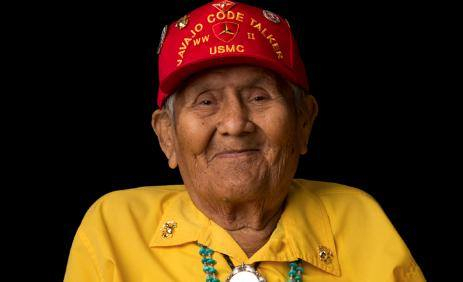 RIP Hero: Remembering Chester Nez, last of the original group of 29 Navajo Code Talkers. Nez passed away on 4 June 2014 in Albuquerque at the age of 93. Nez loved to tell his story to highlight his pride in serving his country and to stress the importance of preserving the Navajo language. He died with appearances still scheduled. Nez lied about his age in order to enlist in the U.S. Marines Corp. Then he and 28 other Navajo men went on to develop a code based upon their native language. 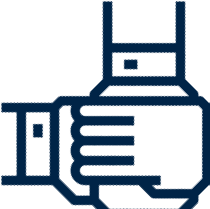 That code became invaluable -- saving lives and enabling the success of many operations. Read more in this New York Times article and in the Stars and Stripes.